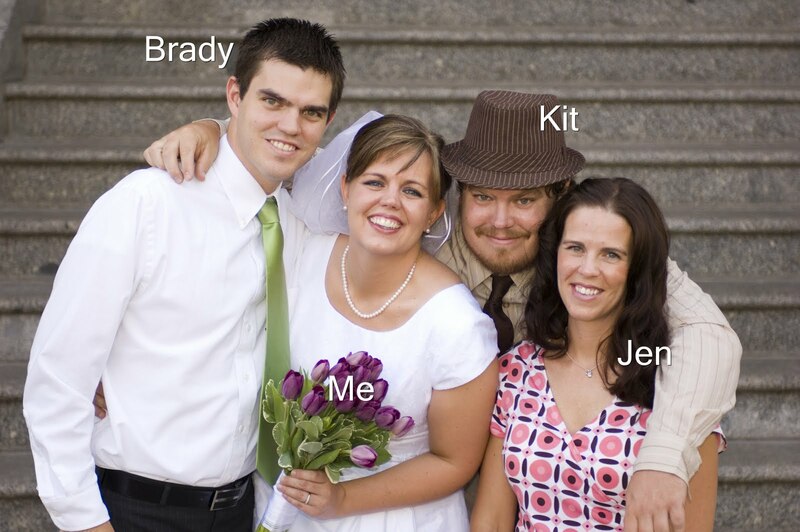 This is my favorite picture of me and my brothers and sister. I wish it wasn't from my wedding, so it would be a little more timeless. But I think it captures us all really well. Growing up as a Nordfelt there was one philosophy that we all subscribed to as brothers and sisters; We can beat on each other and fight as much as we want at home, but the minute we stepped outside, we were each others greatest allies. No one messes with one Nordfelt with out facing all the rest. When my sister and I were in high school, living in Germany, we used to ride a bus to school every day. On one particular morning we had a brutal fight. I don't remember what about. I'm sure it had something to do with me borrowing an article of clothing, or some other trivial matter. We left the house not speaking to each other and boarded our bus. I met up with my friends and proceeded to the back of the bus. Within minutes a boy in our neighborhood came back and started giving us a bad time. He was a senior and didn't think we should be sitting in the back as freshmen. I was never one to back down, even to a senior. If you don't already know...I'm a little stubborn. So I of course stood my ground and the argument started to get a little heated. It was right when the boy called me the "B" word that my sister swung into action. She stood up, came to the back of the bus, grabbed the boy by the shirt collar, pulled his face right up to hers and in a very stern voice she informed him that no one calls her sister a "B". She then proceeded to inform him that if he had a problem with me then he was going to have a problem with her. After her speech, she pushed him back into his seat and walked back to the front of the bus. You have to know that this boy was actually one of my sisters friends. Also, at the time my sister was a mere 5 feet 5 inches and maybe 105 lbs. soaking wet. But it didn't matter, if you know my sister she has a vicious bark and little bit of bite when she needs to. She still didn't speak to me for the rest of the day, but it's ok....that's what Nordfelts do. I'm not sure if we get it from our mom or dad, but all of my sibling have great creativity. We all excel in different mediums, from art, photography, writing, cooking, creating etc... we have all been blessed with creative minds. But Kit...he has the most talent. It doesn't matter what artistic medium he attempts, success is always his. From pottery, carpentry, painting, drawing, design, writing...it's all his. However, as most great artists, I don't think he really knows how talented he is. There is no perceivable perfection in art. It's his great potential for creativity that makes this story so funny. When I was serving my mission, I got a letter from my mom telling me about the amazing poem my brother wrote for his English class. He got an A+ and his teacher had raved about his writing ability. I have written poetry since I was very young and my mom thought, I of all people would be particularly impressed with my brothers accomplishment. At the end of the letter, she enclosed a copy of the poem for me to read. To my surprise...it was one of my poems. Apparently my brother had forgotten about he assignment until the night before. With desperation he went through my room to find my poems, knowing I would have one he could use. I guess even my creative genius of a brother, needs my help from time to time. Brady and I have always had a special bond. I wasn't quite old enough to be a second mom to him, but growing up he was definitely my baby. He used to come crawl into bed with me when he had a bad dream or couldn't sleep. I would scratch is back until he fell asleep. To this day Brady and I have never had a fight. We've disagreed, but never fought. Hard to believe, I know...but it's true. When I was a senior in high school, Brady was 9. I had a TV in my room and Brady loved watching TV with me. He would bring his teddy, footprints, into my room and snuggle right up to me. On one particular night we were watching TV and he suddenly turned to me and said, "So when you graduate, are you going to go away to college?" Me - "I am, but I'll still come home and visit." Brady - "I think I might miss you"
Me - "I think I might miss you too"
...and I did. It's still hard for me to believe that my baby brother is now a father of two. Very sweet! Isn't it great that you are family? Brooke, that is crazy! It is a small world. I'll have to tell Erica. They now also have a baby girl, Kendi. I'm desperately trying to convince them to move to Utah. Anyway, glad we made the connection!